Many of us read books every day, either electronically or in print. We remember the books that shaped our ideas about the world as children, go back to favorite books year after year, give or lend books to loved ones and friends to share the stories we've loved especially, and discuss important books with fellow readers in book clubs and online communities. But for all the ways books influence us, teach us, challenge us, and connect us, many of us remain in the dark as to where they come from and how the mysterious world of publishing truly works. How are books created and how do they get to readers? 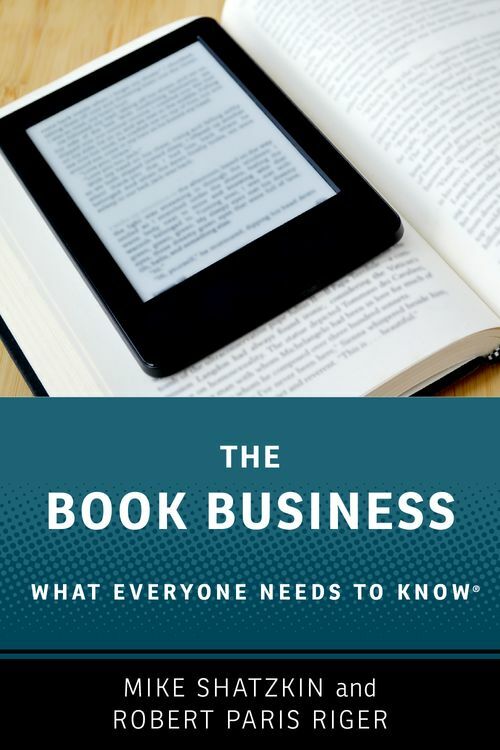 The Book Business: What Everyone Needs to Know® introduces those outside the industry to the world of book publishing. Covering everything from the beginnings of modern book publishing early in the 20th century to the current concerns over the alleged death of print, digital reading, and the rise of Amazon, Mike Shatzkin and Robert Paris Riger provide a succinct and insightful survey of the industry in an easy-to-read question-and-answer format. The authors, veterans of "trade publishing," or the branch of the business that puts books in our hands through libraries or bookstores, answer questions from the basic to the cutting-edge, providing a guide for curious beginners and outsiders. How does book publishing actually work? What challenges is it facing today? How have social media changed the game of book marketing? What does the life cycle of a book look like in 2019? They focus on how practices are changing at a time of great flux in the industry, as digital creation and delivery are altering the commercial realities of the book business. This book will interest not only those with no experience in publishing looking to gain a foothold on the business, but also those working on the inside who crave a bird's eye view of publishing's evolving landscape. This is a moment of dizzyingly rapid change wrought by the emergence of digital publishing, data collection, e-books, audio books, and the rise of self-publishing; these forces make the inherently interesting business of publishing books all the more fascinating. Mike Shatzkin has been a consultant to the book publishing industry and its trading partners on supply chain and digital change issues for more than four decades. His clients have included every major US publisher, many non-US publishers, retailers including Borders and Barnes & Noble, wholesalers including Ingram and Baker & Taylor, and a variety of printers, literary agencies, and digital startups. Robert Paris Riger (1961 - 2018) was a longtime publisher and author. He ran both major book club organizations before he was 30, co-founded the publishing consulting firm Market Partners International, and spent several years at Barnes & Noble building and leading the marketing for their Spark Notes program. He was most recently VP and Director of Pimsleur Language Programs at Simon & Schuster. Robert was fluent in several languages, including German and French, and experienced publishing's digital transition on the frontlines with Spark Notes and Pimsleur. He died unexpectedly a month after this book's manuscript was completed.